SEOUL, Aug. 24 (Yonhap) — From Girls’ Generation to Heize, K-pop’s summer of 2017 has been largely dominated by talented female artists of varying degrees of styles, genres and experiences. But this time, big name boy bands are lining up for fresh releases, bracing for a heated early-fall music chart battle. Undoubtedly the biggest artist in K-pop making return in early fall is BTS. The band officially announced Thursday that it will release a new EP album titled “Love Yourself Seung ‘Her’” on Sept. 18. 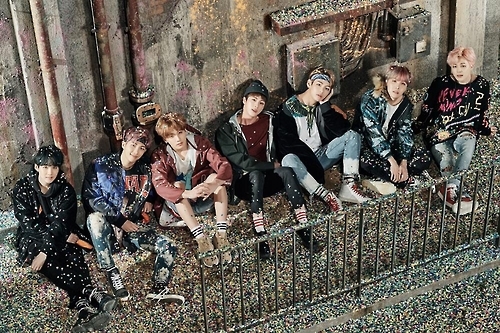 The record, which would be the first new music from the K-pop sensation in seven months, will be first in the band’s new “Love Yourself” series, which will be rolled out in serial format into 2018. Preorders will be available starting Friday. BTS’ two-album “Wings” series has sold more than 1.49 million copies since October of last year in Korea alone. The upcoming EP is also expected to become a financial hit, as the band has announced there will be four different versions of it. Big Hit Entertainment, BTS’ management company, has rolled out several teasers since earlier this month. In May, the BTS won the Top Social Artist award at the 2017 Billboard Music Awards at the T-Mobile Arena in Las Vegas. The seven-member group beat Justin Bieber, Selena Gomez, Ariana Grande and Shawn Mendes, becoming the second South Korean artist to win a Billboard award after Psy won the Top Streaming Song for “Gangnam Style” in 2013. EXO of S.M. Entertainment, another heavyweight, released its fourth full-length album “The War” in mid-July. After selling over 1 million copies in less than a month, it is widely believed that the group will release a repackaged version next month. The band has traditionally released repackaged albums including additional songs and other bonus materials, such as music videos and photos. The group’s three previous full-length albums — “XOXO” (2013), “Exodus” (2015) and “Ex’Act” (2016) — sold over 1 million copies. But this was after sales numbers for the Korean, Chinese and repackaged versions were factored in, where as “The War” reached the milestone without the help of a repackaged album. “Since EXO has already surpassed the 1 million-mark, a repackaged album may help the combined the sales figure to go possibly over 2 million,” a record industry insider said. K-pop veterans now with their mandatory military duties complete are also preparing for comebacks, trying to remain relevant and without playing the nostalgia card. S.M. 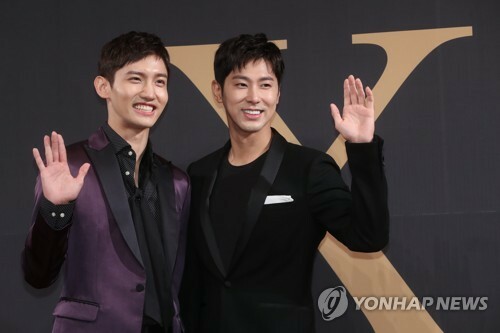 Entertainment duo TVXQ earlier this week staged a three-nation Asia media publicity blitz, almost immediately after Max Changmin, wrapped up his military duty last Friday. The team’s other-half, U-Know Yunho, finished his service in April. The company has dedicated the final week of September as “TVXQ Week” and plans to release Yunho’s solo track “Drop” and Changmin’s new solo song through the company’s online Station program during the week. TVXQ will later embark on a five-city dome concert tour in Japan in November. The company forecasts the Japanese tour, comprised of 14 shows in total, will draw in 650,000 audience members. Super Junior, another seasoned K-pop band, is also preparing for a comeback in October. Though not with the complete 11-member line up, seven members with military service behind them will release a comeback album in two months. Shindong, Leeteuk and Heechul have turned to variety TV in the meantime, while Siwon, who was discharged from the military last week, currently is doing voluntary work in Vietnam as part of a UNICEF charity campaign.